Whether you believe the Book of Mormon or not there is a great story in there that can be compared to what is happening in our country today. Here is the setting: There are two basic groups (or nations) of people who fight against each other from time to time—the Nephites [nee-fites] and the Lamanites [lay-man-ites]. The Nephites have a chief judge and judges who make up their government. Prior to this they had had a king for their leader. For the first few years of the ‘reign of the judges’ there is relative peace. This story takes place 30 years into the reign of these judges. There are many dissenters who want to go back to the days when they had a king. At this same time there is a war going on between the two nations. The leader of the Nephite army is asking for supplies from Zarahemla (the capital of the Nephite Nation). He is becoming frustrated that those much needed supplies are not coming. In a fit of anger he writes to Pahoran, the chief judge, and warns him that they will storm the capital if they don’t get the supplies they need. As it turns out, the “king-men” as they call themselves, have taken the Capital and Pahoran is in hiding. Not only have these king-men taken over Zarahemla, but they are in league with the enemy (the Lamanites). 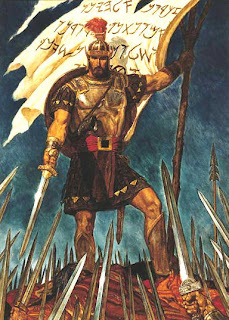 Prior to this war Captain Moroni (the leader of the Nephite army) had already had to deal with the dissenters. In doing so he had inspired many to join him in his fight. And now it came to pass that when Moroni, [who was the chief commander of the armies of the Nephites], had heard of these dissensions, he was angry with Amalickiah. And it came to pass that he rent his coat; and he took a piece thereof, and wrote upon it—In memory of our God, our religion, and freedom, and our peace, our wives, and our children—and he fastened it upon the end of a pole. Italics inserted. I wish we could do as they did in this story. The leader of the Nephite army, with the permission of the chief judge storm the Capital, take the king-men captive, and return Pahoran to the judgment seat. The king-men who will not give up their fight are put to death. At this time in our own country we have dissenters who are trying to usurp our leaders. They appear to be in league with the enemy. They are traitors. They are undermining our sovereignty by weakening our ability to defend ourselves against our enemy.